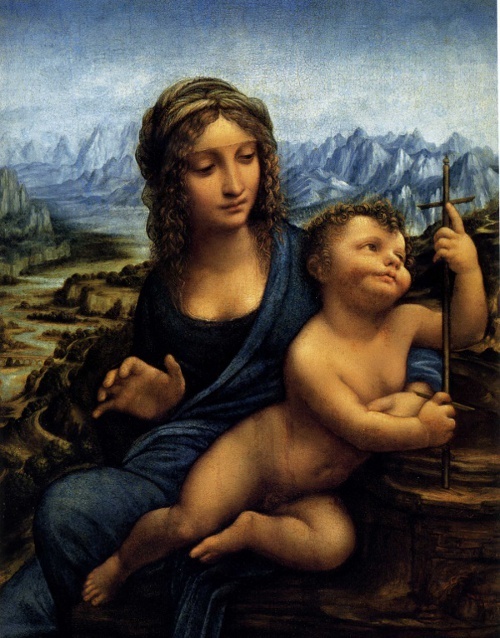 The Madonna of the Yarnwinder, by Leonardo or not by Leonardo? The Madonna of the Yarnwinder. 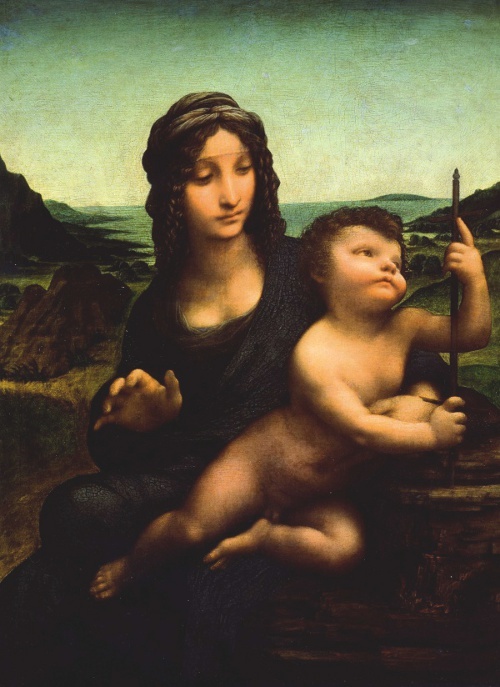 When Leonardo returned to Florence from Milan in 1500, he is known to have started work on a painting for Florimond Robert, secretary to King Louis XIII of France, the so-called Madonna of the Yarnwinder. The painting is described by the Carmelite monk Puetro da Novella in a letter dated 14 April 1501, to Isabella d’Este, Marchioness of Mantua. Isabella had been trying to persuade Leonardo (without success) to produce a painting based on a cartoon of her likeness done by Leonardo the previous year. Novella describes the yarnwinder painting in some detail. “The little picture he is doing is of a Madonna seated as if she were about to spin a yarn. The child has placed his foot on the basket of yarns and has grasped the yarn-winder and gazes attentively at the four spokes that are in the form of a cross. As if desirous of the cross he smiles and holds it firm, and is unwilling to yield it to his Mother who seems to want to take it away from him”. At this stage in his life, da Vinci seems more preoccupied with his scientific studies rather than any attempts to complete paintings, this is highlighted in Novella’s a previous letter to Isabella (3 April 1501). “He has done nothing else save for the fact that two of his apprentices are making copies and he puts his hand to one of them from time to time. He is hard at work on geometry and has no time for the brush”. Several versions of the painting exist, among these two are considered to be of such quality that they can be attributed, at least in part, to Leonardo himself. These are the Buccleuch Madonna and the Lansdowne Madonna. Oil on Walnut, 48.9 x 36.8 cm. The 10th Duke of Buccleuch. Oil on Wood, 50.2 x 36.4 cm. Two versions of Leonardo da Vinci’s Madonna of the Yarnwinder are displayed here. In both of these paintings, the attribution to Leonardo remains controversial and it is clear from Novella’s first-hand account that members of his workshop were copying from da Vinci with the master adding to, in varying degrees, some parts of the work. The yarnwinder takes the shape of a cross, this symbolic image of the future Passion of Christ becomes a plaything in the hands of the child. The Virgin attempts to hold onto the twisting child with her left hand, her head rotates following the movement of her son’s twisting body. Her right hand is raised in protection adopting a similar position to the hand of the Madonna of the Virgin of the Rocks. The composition expertly conveys a sense of movement reminiscent of the figures in Leonardo’s Last Supper. Madonna of the Yarnwinder back to Leonardo.